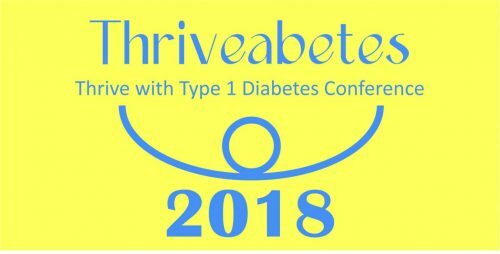 Last week, registration opened for Thriveabetes the type 1 diabetes conference which takes place on Saturday 24th February 2018 in Dublin. And with over four months until the event takes place we are almost one third of the way to being sold out. If you are an adult with type 1 diabetes you might be asking yourself what’s different about this conference? Well, for starters, I’m an adult who has lived with type 1 diabetes for 24 years (so far) and it’s not often I get to be in a room with over one hundred other adults with insulin dependent diabetes. And just knowing that, before you walk into the room means you have made friends before you say “Hello”. An additional bonus to being in the room with so many people like me is that the only experts in the room aren’t the ones giving presentations, it’s the person sitting next to me too. However, our speakers are world class. They come from all over the UK, US and Ireland and most of them have type 1 diabetes also. Elizabeth Rowley is the Founder and Director of T1International , a global organization that advocates access to insulin, supplies, and medical care for all people with type 1 diabetes around the world. She will talk about the work her organisation does and how T1 International support local communities by giving them the tools they need to stand up for their rights so that access to insulin and diabetes supplies becomes a reality for all. She was born in the United States and has lived with type 1 diabetes for 25 years. Elizabeth moved to London in 2011 to complete her Master’s degree in International Development and has worked with nonprofits, diabetes and health organizations ever since. She believes that where you were born should not determine whether you live or die with diabetes. Diabetes Burnout, also referred to as diabetes distress is when someone with diabetes grows tired of managing their condition, and then simply ignores it for a period of time, or worse, forever. Type 1 isn’t just about counting carbs, checking glucose levels and taking insulin. The disease takes an emotional and psychological toll as well. And it’s not unusual for some to just get fed up with all of it. Joe has been living with type 1 diabetes for over 50 years. He grew up in New York but now lives in California. He is a registered nurse, diabetes educator and family therapist and works extensively with both patients and professionals on the "Family-Approach to Diabetes Management" and dealing with psychosocial issues that come from living with type 1 diabetes. More and more doctors are prescribing medication, in addition to insulin, to manage insulin dependent diabetes. In this session, we will discuss the technology and what other medications might be available to help make life with diabetes easier. Kevin Moore is a Consultant endocrinologist in Tallaght Hospital, Naas General Hospital and the Beacon Hospital. Kevin has been making occasional guest appearances at the Type 1 Diabetes Support group meetings in Dublin for a number of years. Fear of hypos is one of the biggest reasons that people with type 1 diabetes avoid exercise, even though we know that it really helps with glucose management. Dr. Lumb has worked with the OneTouch Sports Weekend (formerly known as the Animas Sports Weekend) since it began. He is a Consultant in Diabetes and Acute General Medicine at Oxford University Hospitals NHS Foundation Trust. Through his career he has been interested in the management of Type 1 diabetes for sport and exercise and has worked with athletes in nationally recognised clinics in the area. He is particularly interested in how technology can be helpful in this arena. His other professional interests include inpatient diabetes care, antenatal diabetes, cystic fibrosis related diabetes, and integrated diabetes care. Outside of work he is a keen cyclist. and were the leads in the setting up of the National DiabeticRetina Screen programme. They also published the Model of Care for All Children and Young People with Type 1 Diabetes. During this presentation, Prof Dinneen will update us on what’s next. In 2016, Prof Seán Dinneen; Consultant Endocrinologist, UHG, was appointed as National Lead for the Diabetes Clinical Programme of the Irish Health Service Executive. His professional interests include developing and evaluating programmes of self-management education for people with diabetes, developing optimal models of community-based diabetes care and understanding the diabetic foot. He was part of successful bids which brought a School of Podiatry and a Clinical Research Facility to NUI Galway. As you can gather we have a a very full day in store packed with lots of information for adults with type 1 diabetes at Thriveabetes. Please note that if you have type 1.5 (LADA) or if you are an adult with type 2 diabetes on intensive insulin therapy, you are very welcome to join us at Thriveabetes also.